Organic Farmers Bash FDA Restrictions On Manure Use : The Salt Many organic farmers are hopping mad at the U.S. Food and Drug Administration. Their reason? Fertilizer. The FDA, as part of its overhaul of food safety regulations, wants to limit the use of animal manure, which organic farmers call a precious resource and a basis of their farming practices. Jim Crawford hauls his vegetables to farmers markets in Washington, D.C. Many organic farmers are hopping mad at the U.S. Food and Drug Administration, and their reason involves perhaps the most underappreciated part of agriculture: plant food, aka fertilizer. Specifically, the FDA, as part of its overhaul of food safety regulations, wants to limit the use of animal manure. "We think of it as the best thing in the world," says organic farmer Jim Crawford, "and they think of it as toxic and nasty and disgusting." Every highly productive farmer depends on fertilizer. But organic farmers are practically obsessive about it, because they've renounced industrial sources of nutrients. So on this crisp fall morning, Crawford is rhapsodic as he watches his field manager, Pearl Wetherall, spread manure across a field where cabbage grew last summer. "All that green material — that cover crop and the cabbage — all mixed up with that nice black manure that's just rich and full of good microorganisms, and we're going to get a wonderful fertility situation for next spring here," he says. 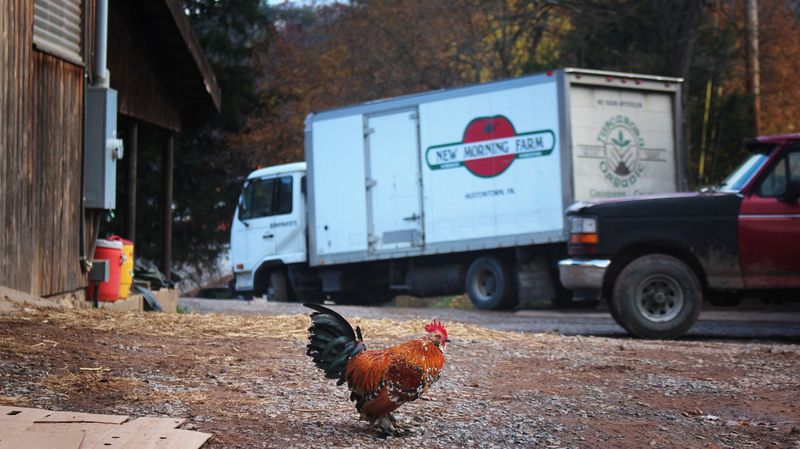 Crawford has been farming organically in south-central Pennsylvania for 40 years. Crawford, founder of New Morning Farm in south-central Pennsylvania, buys hundreds of tons of manure every year from a big turkey farm a few miles away. "It's really at the heart of our operation for having good, rich soil, and good fertility, so that we have the highest-quality crops." It's also part of a natural cycle, and the basis of organic farming. Most crops strip vital nutrients from the soil. 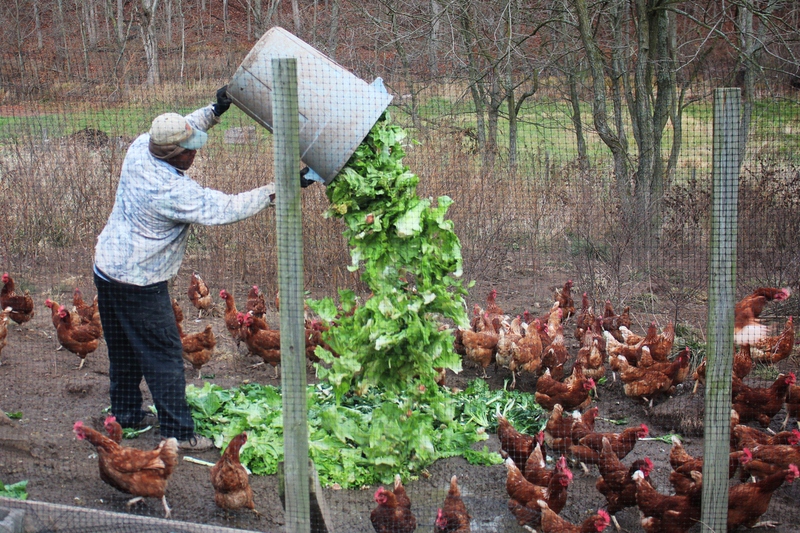 But the nutrients don't disappear; if you feed those crops to cattle or turkeys, the nutrients mostly end up in manure. For the turkey farmer, the manure is waste. For Crawford, it's precious. "Cycling nutrients. That's what it's all about. Cycling organic nutrients." This is a typical practice among organic farmers, especially the smaller ones. But they may now have to change. The Food and Drug Administration considers manure a food safety risk. Disease-causing microbes, such as salmonella or toxic forms of E. coli, are commonly found in animal waste. Patricia Millner, a microbiologist with the U.S. Department of Agriculture's research center in Beltsville, Md., says scientists are now trying to figure out exactly how long such bacteria survive in the soil. "In some cases, salmonella will survive for a few weeks; in other cases, it'll be reported that it survives for 300-plus days," she says. 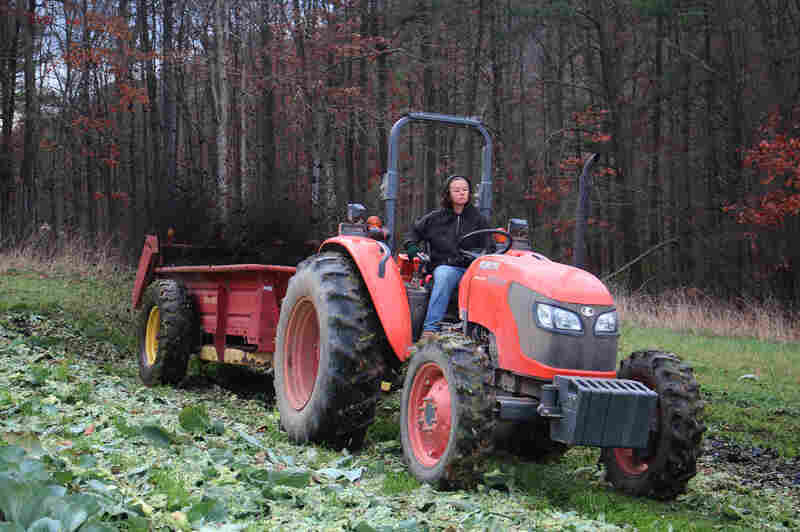 Pearl Wetherall, field manager at New Morning Farm, spreads manure. When they survive, microbes do get on food. Carrots or radishes, of course, grow right in the soil. But bacteria also end up on salad greens. Raindrops, for instance, splash soil and microbes onto the plants. There's a lot of uncertainty about exactly how big of a risk this is. But the FDA is saying better safe than sorry. The rules don't cover the smallest farms. They apply to farms with more than half a million dollars in annual sales, or which supply food to supermarkets. But that includes Crawford's farm. He already follows the organic rules; he doesn't harvest crops within four months of spreading manure. But having to wait nine months — longer than a growing season — would completely disrupt his operations. "We wouldn't even be able to function," he says. There is an alternative: composted manure. The heat from composting kills disease-causing microbes. 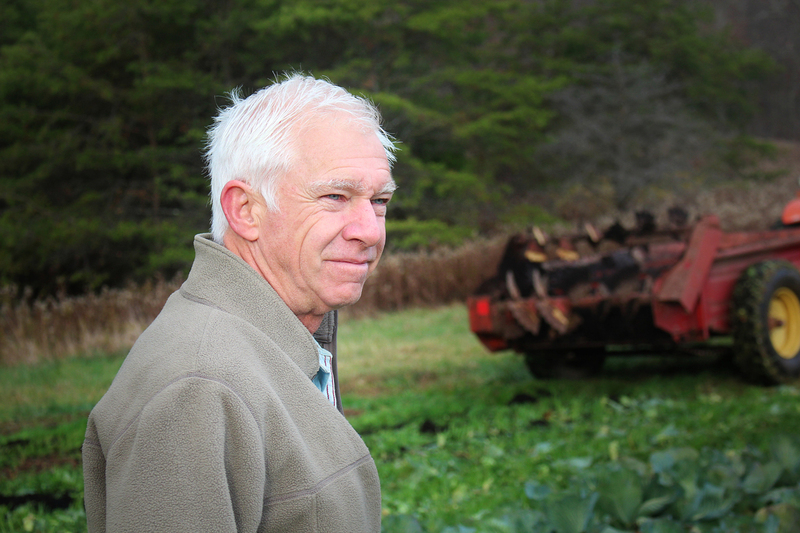 But Crawford says compost would cost him anywhere from three to six times more than manure. And he just doesn't see why he should have to switch, because he doesn't believe that what he does now is at all risky. Feeding the chickens at New Morning Farm. "No one's ever been sickened by anything we've grown, in probably millions of transactions between us and our customers over 40 years," he says. Crawford sells most of his food at farmers markets in Washington, D.C. Yet organic farmers are not united in their opposition to the FDA regulations. There's a divide between large and small producers. Earthbound Farm, in California, is among the biggest organic producers of salad greens. Will Daniel, the company's chief food integrity officer, says, "History is not always your greatest ally, unfortunately. We never thought that we would see spinach or other produce involved in outbreaks." But in 2006, his company's spinach was linked to an outbreak of E. coli poisoning; 200 people got sick. Three died. Raw manure was not the source of that outbreak. (There's evidence the E. coli could have come from wild pigs that got into the fields.) But Daniel says using manure does involve risks that his company won't take. Instead, Earthbound Farm uses mostly "a pelletized, processed chicken manure product" that's been treated with heat and pressure to kill all microbes. "We've gone in that direction because we feel that it's very important to assure that we are not spreading these pathogens in our fields, that could lead to contaminated product," he says. Daniel supports the FDA's proposed rules on manure. Many smaller organic farmers, meanwhile, are sending the FDA a blizzard of comments, arguing that the environmental benefits of using manure far outweigh the risks. The comment period ends on Nov. 22.